An exhibition in the Dean’s Cloister entitled ‘Our Diamond Queen’ ‘The Life & Work of Her Majesty as Princess & Queen’ will be in place from Saturday 26 May until the end of July. The exhibition (at the Chapel exit) is open Monday – Saturday during Chapel opening hours (10am – 4pm). The exhibition has been kindly sponsored by Stanley Gibbons Ltd. Windsor Castle Admission Charges apply. On Sunday 3 June the bellringers rang a full peal (5040 changes of Grandsire Triples) to mark the Jubilee. A shorter ring took place on Saturday 2 June to mark the Coronation anniversary. The full peal took three hours and ten minutes without a break and was last undertaken in the Curfew Tower to mark The Duke of Edinburgh’s 90th birthday in 2011. Click here to hear the bells ringing. 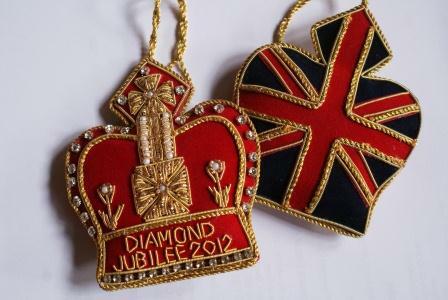 The Chapel giftshop sells a wide range of Jubilee items from hanging decorations and china to soft toys and bookmarks. 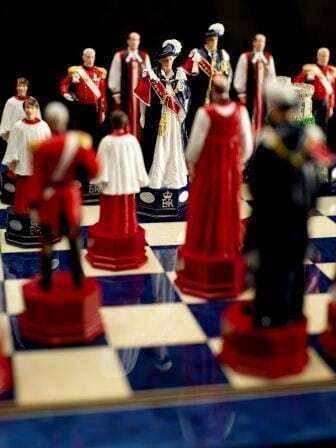 The especially commissioned Diamond Jubilee chess set includes models of The Queen and The Duke of Edinburgh in Garter robes. The Bishop is depicted by the Dean of Windsor, the Knight by a Military Knight of Windsor, the Castle by the Round Tower and the Pawns by Choristers. The models of The Queen and The Duke of Edinburgh are available as a pair without the remainder of the set. For more details please visit the Chapel Shop. and I vow to thee my country and the National Anthem. 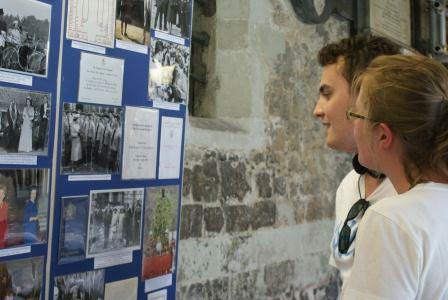 There was a Children’s activity trail in the State Apartments and St George’s Chapel from Saturday 2 June until Sunday 10 June (except Sundays in the Chapel). During their visit children were invited to spot where some small crowns had been placed. A screen was placed in the Nave of St George’s Chapel on Tuesday 5 June in order that visitors could see something of the Diamond Jubilee Service in St Paul’s Cathedral. As part of the Diamond Jubilee weekend, BBC One broadcast a personal tribute to Her Majesty The Queen by His Royal Highness The Prince of Wales. In this unique film The Prince reflected on various public events and private family moments during the sixty years of The Queen’s reign, and explored previously unseen photographs and cine films from Her Majesty’s private collection – many of them shot by The Queen herself. The filming featured St George’s Chapel and other parts of Windsor Castle together with Buckingham Palace, Balmoral and Highgrove. The film aired on the evening of Friday 1 June on BBC 1. Also over the Diamond Jubilee weekend a special edition of The Culture Show examined Royal Portraiture; part of the programme was recorded by Alistair Sooke in the Quire of the Chapel. 40 local BBC Radio stations broadcast a documentary over the Jubilee weekend which was partly recorded in St George’s Chapel. The programme called ‘The Queen – 60 years of Defending the Faith’ was broadcast on BBC Radio Berkshire on Monday 4 June.